Partnerships, unmanned spacecraft, technologies and sensors were some of the topics covered in a panel discussion and press luncheon held at GEOINT Symposium 2015 in Washington D.C. recently, by Northrup Grumman. 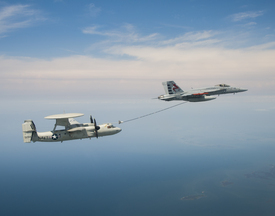 An E-2C test aircraft assigned to Air Test and Evaluation Squadron (VX) 20 conducts an aerial refueling dry-plug engagement with an F/A-18. Northrup Grumman, known also as an aerospace/defense company, is a global security company providing innovative systems, products and solutions in unmanned systems, cyber, C4ISR, and logistics and modernization to government and commercial customers worldwide. Those sitting on the panel included: Sean Love ISR Business Development Director (moderator), Hugh McFadden – Manager of Emerging Intelligence Programs, Steve Ryan – Senior Mission Engineer, Gary Wu – User Experience Engineer, and Steve Feng – User Experience Engineer, IMPACT Team. Northrop Grumman’s solutions provide unprecedented precision, location and identification of threats. We have successfully fielded over 300 SIGINT and GEOINT systems and have the experience to integrate a broad array of collection types together into a multi-INT capability. Moderator Sean Love asked about how you might focus technology resources and human resources, with the emergence of leading technologies taking a front row. “How do they fit in with the data-centric model?” he asked, noting that the government is no longer in the commanding position of owning all the sensors. In the Department of Defense many people express frustration at the acquisition process. There is concern that commercial companies may not understand intelligence work. At the same time, there is growing government interest in small satellites which Northrup Grumman provides products and solutions for and what to do with the data. The old model in a lot of ways is no longer effective because of the cost and time involved. 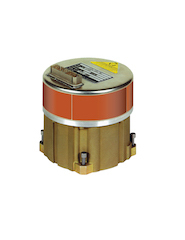 Northrop Grumman’s new LN-200C fiber-optic gyro inertial measurement unit is specially designed for the commercial market. 15-20% of U.S. government software projects fail completely. Requirements don’t match user needs. The user experience needs to take data and make it actionable. Also, it’s important to take the human aspects of interacting with technology and conduct research on it. Data is constantly evolving and never rests. Timeliness of data has an impact and decision advantage that is sometimes short term. “We need to condition data so the user doesn’t have to do it, and do it with a pragmatic approach,” said Feng. There are legalities about taking on commercial sensors, “there are so many sensors and an ocean of data,” said Love. “Mission-driven processes collaborate technology development with customers and roll it back into our larger research,” said Feng. “The analyst already buys into it. This is a user-centric design process. This entry was posted on Tuesday, July 7th, 2015 at 12:41 pm. You can follow any responses to this entry through the RSS 2.0 feed. You can leave a response, or trackback from your own site.